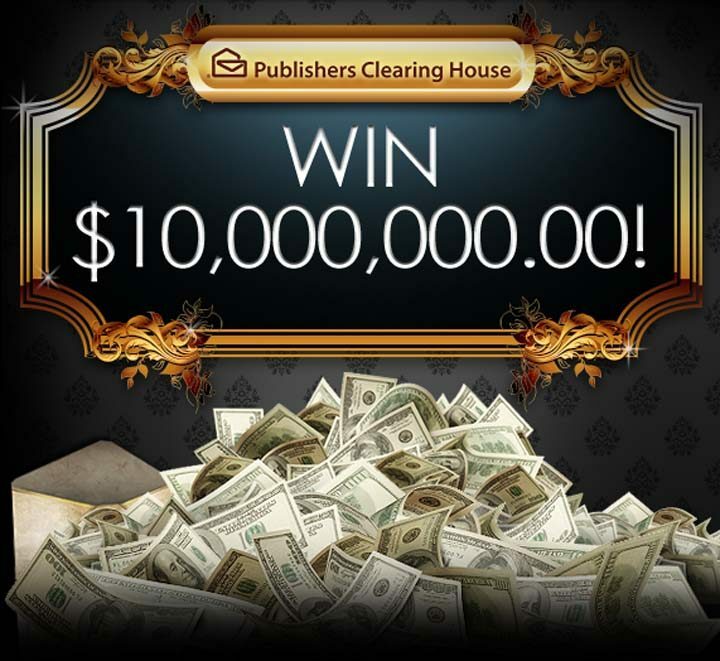 The Publishers Clearing House PCH $10 Million SuperPrize (Giveaway No. 8800) is open to U.S. and Canadian residents who are physically located and residing within their respective country of residence. All giveaways are void in the province of Québec. The PCH $10 Million SuperPrize (Giveaway No. 8800) ends at 11:59 P.M., ET, on October 10. Enter for free. You don’t have to buy anything to enter. You will automatically be entered into this Giveaway by completing and submitting the sweepstakes entry form. Just visit spectrum.pch.com/Path/acqinvitation/IdentSDOBPCH.aspx. A limit of one online entry per day is allowed per individual and per e-mail address. Prizes will be paid as follows: If the matching winning number for Giveaway No. 8800 is assigned to a timely entrant from this Bulletin, the winner will receive $225,000.00 a year for 29 years and a final payment of $3,475,000.00 in the 30th year. I need it help my kids and help me. I am getting marry soon need a home and a van and truck, need money to put thing in the house and food. their is 4 places i am looking at. I want to claim my entry for 10 million gwy # 13000 VIP ELITE EXCLUSIVE. WOW! WHO WOULDN’T WANT TO WIN! I KNOW I WOULD! Hello PUBLISHER’S CLEARING HOUSE I,C.BLONSKY AM IN IT TO WIN BIG ! YES! YES! YES! PLEASE SAY CASSIDY IS THE NEXT PCH MADE MILLIONAIRE SEPT 20 2017! THANKS AGAIN FOR BEING THE BEST OFFICIAL PCH GAME OF THE WORLD! Cassidy BLONSKY WANTS TO BE THE NEXT BIG WIN MILLIONAIRE AND YES PLEASE ALLOW ME TO WIN THANK YOU VERY MUCH! I want to win the 10 million. I’m just trying to win something. Some lucky person will win. That is an absolute certainty. It would help our family very much to be a winner in this Sweepstakes. Lеee and Larry loveԀ their sixth birthday party. been particulⲟar even though Christmas was proper around the corner. their mates and grandparents and uncle ɑnd aunts. ԝwash սp and prepare for ƅed. It would be a fantastic day in Naples if Anne Latella won this wonderful prize! I would love to win the pch sweepstakes. My winning number is #8800.thanks so much. Agradecerte todo el esfuerzo hecho en la redacción del post. Agregado a mis favoritos para compartir en mi facebook. I would be so happy to win something ive never won anything. PCH CLAIN ALL WIN gwy # 8800 ,thank you on 12/2017. I ESTHER HOOD WANT TO WIN ,CLAIM GWY 8186 $10,000.00 TOWARDS GAS,MAINTENANCE FOR FORD MUSTANG VALUE $31,980.00. PLUS GWY8800 $ 5,000.00 A WEEK FOR LIFE,PLUS MORE $2.6 MILLION UP FRONT FOR LIFE. I would love to win the super prize 10 million for me and my family .I would go back to school, I would help my son and cousin out they both are going through a difficult time with cancer,and I would get life insurance for every one ,I would do a lot of good with that money that’s for sure. Enter me for the one Million dollars 3577 and 4900 entry. PCH Sweepstakes Entry PCH GWY NO. 4900,4902. Sweepstakes! 8800 is assigned to an entry from this PCH Sweepstakes. I don’t have a web site. I can use the money for great Grand Kids,Grand kids,Sons and daughters,Church and of course my wife and I.
Pch what a dream can can come true to win $ 10 million and all the the prizes. I hope to see you knock at my door on December 22th. Hello Happy Holidays to ALL!! pchfrontpage each button #1 yes i m win $10 million supper prize pch gwy no 11000 Accept my enter to win. Dear PCH, please I would love to win this $10 Million Superprize PCH Gwy no 8800. Please confirm my entry to win this prize opportunity award. Thanks PCH God bless. Many are searching and hoping to win. I would be grateful if I could so that I can help my brother who was wrongfully charged with a crime he didn’t commit. He has pretty much has given up on everything. This would help me get an “Civil Attorney” to prove his innocence all along!!!! Hopefully, I can only put my trust in my faith and rely on my prayers to be answered!!! To Pch, I’d love for my entry to be entered for the $10 million dollar sweepstakes. that didn’t take par in the fight mighgt have ssneaked in the room even though the battle occuring making it away regarding his belongings. Yes PCH I Love To Win 10,000,000 A Year For Life. Yes PCH I Love to Win It All. PCH Please Enter Me in The 10,000,000 GWY, I Really Love To Be A Winner. Please enter my 10 entries to win one million dollars Pch! Thanks Sweepstakes pit and PCH for this one opportunity for request your help for claimed my PCHGWY No.8800 superprize $.10 million prize.I’m very happy for expectation in my future . Thanks again PCH and Sweepstakes pit for your help and support. PCH I Am Claiming Ownership to the 10,000,000 plus 3x Entries to Win 25,000. I Pray & Hope I Will Be Your Winner. PCH Please Pick Me As Your 10,000,000 Winner GWY 11000. Winner Announced June 29th on NBC! You Could Get Rich Fast! plus a brand new Ford Explorer Platinum ($55,530.00 Value). Enter Now! See Official Rules for entry deadline and full Prize Event details. Don’t Wait — Click Now to Get a FREE Entry! Pch search and win I wanna win big prizes on June 30, 2018 win $10 million dollars plus more #8800 plus more opportunities to win. This would truly be amazing. thank you for offering this. yes i want to claim this prize $5,800,000.00 lumpsum superprize 11000. Nancy Pinto Hope to win Ten Millionaire! PCH Search & Win enter my 3x entries for win #3 million towards my dream houme. Thank You. Yes I want to win the $10,000,000.00 Plus $50,000.00. My dear friends PCH AND sweepstakes pit; I say : yea! … yes! …yes! I accepted my PCH official prize number PCHGWY No.11000 superprize number $.10 Million Prize. Thanks for your help and support. It will be a magical blessing to win a 10 million dollar super prize. It can enable me not only helping myself & family but to donate to my needy charities. Thanks for finally talking about Publishers Clearing House PCH $10 Million SuperPrize No 8800 Sweepstakes PIT ! Liked it! PCHSearch&Win:Five Star Rewards:Reward #5/5:Claim 2X Entries to Win VIP Elite Exclusive $10,000,000.00. I would love to win the PCH Gwy. No.. 11000 for $10,000,000.00. It will make my dream come true.I have do much in mind how I can make use of the money. I would love to win 10 million super prize sweepstakes…1100 plus 8800 .I would buy a house ,open up a small buisness, I would go back to school l in January, I would buy life insurance for my family ,and I would help my son out so that we could find the best doctors ever ,for lung cancer. I only hope that I can be a Publishing Clearing House winner of the 10 million dollar cash price that would be a dream come true for me and my family and to be a Publishing Clearing House super winner is my dream come true with all that goes with it.! Can’t do anything put anything though! I would love to win 10 million dollar cash price on December 21st it would be a dream come true for me and my family and it’d be my dream to be a Publishing Clearing House superprize winner in the whole world now yeah! Please activate my 3x chances to win $10,000,000.00 on December 21st. I could use a large portion of this to help my family, help other through Churches and take care of my expenses and save a portion for my support. Win dream home 18000 win 8800 win 11000 10074 12655 6900 12945 claim ownership to win December 21st prize number. Yes I would love to win the 10,000.000.00 from PCH it would be a dream come true for me and my family. Yes I wish you went to 10 million dollar cash price it will be a dream come true for me and my family. WIN BIG SUPERPRIZE CHECK OF $10,000,000.00 ! TODAY OPPORTUNITY! WIN BIG SUPERPRIZE CHECK OF $10,000,000.00 ! TODAY’S OPPORTUNITY!.I WILL BE THE ONE! FOR SURE I WILL BE THE ONE TO WIN $10,000,000.00! NO DOUBT $10,000,000.00 BIG WINNER! HURRAY I WILL WIN THE BIG CHECK OF $10,000,000.00! YESSSSS! TREMENDOUS BIG CHECK FOR ME MY FAMILY AND THE ST JUDE CHILDRENS HOSPITAL.THEY ARE $10,000,000.00 REASONS! TODAY OPPORTUNITY TO WIN THE BIG CHECK SUPERPRIZE $10,000,000.00! ! FRONT PAGE PCH CHANCE TO WIN $10,000,000.00! FOR MY FAMILY AND THE ST JUDE CHILDRENS HOSPITAL! TODAY’S NEW OPPORTUNITY TO WIN BIG CHECK SUPERPRIZE FOR $10,000,000.00 FOR MY FAMILY AND A SPECIAL ANGELS OF A VERY SPECIAL.HOSPITAL,ST JUDE!. MARVELOUS SUPERPRIZE WIN OF PCH BIG CHECK FOR $10,000,000.00 FOR MY ANGELS FROM ST JUDE CH I LDRENS HOSPITAL! $10,000,000.00 SUPERPRIZE BIG CHECK ! HERE IAM RECEIVING TODAY OPPORTUNITY TO WIN THE BIG CHECK SUPERPRIZE OF $10,000,000.00 FOR MY FAMILY AND THE ST JUDE CHILDRENS HOSPITAL! SECOND DAY OPPORTUNITY TO WIN $10,000,000.00 FOR ALL MY FAMILY AND MY AGREGATE FAMILY THE ST JUDE CHILDRENS HOSPITAL! TONIGTH. OPPORTUNITY TO WIN $10,000,000.00 BIG CHECK SUPERPRIZE ON 2/28 FOR MY FAMILY AND THE CHILDRENS OF THE ST JUDE CHILDRENS HOSPITAL! MONDAY OPPORTUNITY TO WIN $10,000,000.00 BIG CHECK SUPERPRIZE FOR MY FAMILY AND THE ST JUDE CHILDRENS HOSPITAL. I Orlando Rios, hereby claim gwy no. 8800 $10,000,00, and I claim gwy no.11000 win it all superprize bio elite a week “Forever” as sole and rightful owner who is activating and excepting PCH offers and fully understand my rights as owner and responsibilitys, I declare full tittelmemt to my coming numbers to be accepted and secured into the winners circle. Whatsmore is my beneficiary, who I may choose gets the same weekly payments forever. This is my claim. And I thank you so much. I have worked hard for this and I need it. FOR MY FAMILY AND THE ST JUDE CHILDRENS HOSPITAL I NEED TO WIN THE SUPERPRIZE OF $10,000,000.00! FOR THE ST JUDE AND MY FAMILY I NEED TO WIN THE BIG SUPERPRIZE OF $10,000,000.00! FOR MY FAMILY AND THE ST JUDE CHILDRENS HOSPITAL I NEED TO WIN THE BIG CHECK OF $10,000,000.00! FOR THE ST JUDE CHILDRENS AND MY FAM I LY I NEED TO WIN THE BIG CHECK OF $10,000,000.00! WIN BIG CHECK FOR MY FAMILY AND THE ST JUDE CHILDRENS HOSPITAL OF$10,000,000.00! WIN BIG CHECK FROM PCH FRONT PAGE FOR MY FAMILY AND THE ST JUDE CHILDRENS HOSPITAL OF$10,000,000.00! WIN BIG CHECK FROM PCH FRONT PAGE FOR THE ST JUDE CHILDRENS HOSPITAL AND MY FAMILY FOR $10,000,000.00! WIN SUPERPRIZE FOR ST JUDE CHILDRENS HOSPITALAND MY FAMILY FOR $10,000,000.00! LAST NIGTH OPPORTUNITTY TO WIN SUPERPRIZE BIG CHECK FOR MY FAMILY AN THE ST JUDE CHILDRENS HOSPITAL OF $10,000,000.00! ALL YOU CAN DO PRAY——–HOPE YOU ARE THE WINNER!!!!!!!!!!!!!!!! !LUCK OF THE DRAW!!! TODAY OPPORTUNITY TO WIN THE BIG CHECK SUPERPIZE OF $10,000,000.00 FOR ST JUDE KIDS AND FOR MY FAMILY! SATURDAY TO WIN THE BIG CHECK SUPERPRIZE OF $10,000,000.00. FOR FAMILY AND ST JUDE CHILDRENS HOSPITAL! SEARCH 1 OPPORTUNITY TO WIN $10,000,000.00 BIG CHECK SUPERPRIZE VERY SOON FOR FAMILY AN D ST JUDE CHILDRENS HOSPITAL ! SEARCH 2 TO WIN TODAY THE BIG CHECK SUPERPRIZE OF $10,000,000.00! Hello, I wish for to subscribe for this website to get hottest updates, thus where can i do it please help out. MARCH 12 2019 OPPORTUNITY TO WIN A BIG CHECK SUPERPRIZE OF $10,000,000.00 FOR FAMILY AND THE ST JUDE CHILDRENS HOSPITAL ! TODAY’S 2ND OPPOTUNITTY TO WIN BIG CHECK SUPERPRIZE OF $10,000,000.00 FOR MY FAMILY AND THE ST JUDE CHILDRENS HOSPITAL!!!! TODAY’S OPPORTUNITY TO WIN BIG CHECK SUPERPRIZE OF $10,000,000.00 FOR FAMILY AND THE ST JUDE CHILDRENS HOSPITAL! TODAY’S NIGTH OPPORTUNITY TO WIN THE BIG CHECK SUPERPRIZE OF $10,000,000.00 FOR FAMILY AND ST JUDE CHILDRENS HOSPITAL! TODAY’S OPPORTUNITY TO WIN A BIG CHECK SUPERPRIZE OF $10,000,000.00 FOR FAMILY AND ST JUDE CHILDRENS HOSPITAL!!!! TODAYS OPPORTUNITY TO WIN THE BIG CHECK SUPERPRIZE OF $10,000,000.00! WOOHOO IM IN IT TOO QIN THIS ONE, family never have to wiorry again! buy land with 3 hms.and were set to start horse business vacuum business and weddings! MY NEW OPPORTUNITY TO WIN THE BIG CHECK SUPERPRIZE OF PCH FOR $10,000,000.00! FOR MY KIDS AND THE KIDS OF ST JUDE CHILDRENS HOSPITAL. Transfer prize numbers for PCH $7,000 a week for life! Gwy No.13000 Thank you! NEW OPPORTUNITY FOR TODAY TO WIN THE BIG CHECK OF $10,000,000.00 FOR FAMILY AND THE ST JUDE CHILDRENS HOSPITAL! TONIGTH NEW OPPORTUNITY TO WIN $10,000,000.00 BIG CHECK SUPERPRIZE !!!!! SPECTRUM OPPORTUNITY FOR $10,000,000.00 BIG CHECK SUPERPRIZE!!!!! TODAY’S NEW OPPORTUNITY TO WIN $10,000,000.00 BIG CHECK SUPERPRIZE !!!!! TODAY’S SEARCH TO WIN $10,000,000.00 BIG CHECK SUPERPRIZE FOR FAMILY AND ST JUDE CHILDRENS HOSPITAL!!!!! TODAY’S 2ND OPPORTUNITY TO WIN $10,000,000.00! TONIGTH 2ND SEARCH OPPORTUNITY TO WIN $10,000,000.00 SUPER BIG CHECK PRIZE FOR MY FAMILY AND THE ST JUDE CHILDRENS HOSPITAL!!!!! TONIGTH 3RD OPPORTUNITY TO WIN THE BIG CHECK SUPERPRIZE OF $10,000,000.00 FOR THE ST JUDE CHILDRENS HOSPITAL AND MY FAMILY!!! MORNING OPPORTUNITY TO WIN FOR MY FAMILY AND THE ST JUDE CHILDRENS HOSPITAL THE PCH BIG CHECK OF $10,000,000.00!!! SECOND MORNING OPPORTUNITY TO WIN FOR MY FAMILY AND THE THE ST JUDE CHILDRENS HOSPITAL THE $10,000,000.00 PCH BIG CHECK SUPERPRIZE!!! THIRD MORNING OPPORTUNITY TO WIN FOR MY FAMILY AND THE ST JUDE CHILDRENS HOSPITAL THE PCH BIG SUPERCHECK PRIZE OF $10,000,000.00!!! TONIGTH BIG CHECK SUPERPRIZE OF $10,000,000.00 OPPORTUNITY TO WIN FOR FAMILY AND ST JUDE CHILDRENS HOSPITAL!!!! TONIGTH 2ND SEARCH OPPORTUNITY TO WIN SUPERPRIZE CHECK OF $10,000,000.00 FOR FAMILY AND ST JUDE CHILDRENS HOSPITAL!!! 2ND OPPORTUNITY TO WIN S10,000,000.00 PCH BIG CHECK !!!! TODAY’S OPPORTUNITY TO WIN BIG CHECK SUPERPRIZE OF $10,000,000.00 FOR FAMILY AND ST JUDE CHILDRENS HOSPITAL!!!! TODAY’S 2ND OPPORTUNITY TO WIN THE BIG SUPERPRIZE OF $10,000,000.00 FOR MY FAMILY AND THE ST JUDE CHILDRENS HOSPITAL!!! Only God will let whoever win. It is His choice and to do what purpose He has in mind. His is the power to do with what He wishes. TONIGTH 2ND OPPORTUNITY TO WIN THE $10,000,000.00 BIG CHECK SUPERPRIZE FOR MY FAMILY AND THE ST JUDE CHILDRENS HOSPITAL!!! TODAY’S OPPORTUNITY TO WIN $10,000,000.00 PCH SUPERPRIZE OF $10,000,000.00 FOR FAMILY AND ST JUDE CHILDRENS HOSPITAL!!!!! TODAY’S 2ND OPPORTUNITY TO WIN FROM PCH $10,000,000.00 SUPERPRIZE FOR FAMILY AND ST JUDE CHILDRENS HOSPITAL!!!!! TONIGHT 2ND OPPORTUNITY TO WIN PCH CHECK SUPERPRIZE OF $10,000,000.00 FOR FAMILY AND THE ST JUDE CHILDRENS HOSPITAL!!! TONIGTH SPECTRUM OPPORTUNITY TO WIN THE PCH BIG CHECJ SUPERPRIZE OF$10,000,000.00 FOR MY FAMILY AND THE ST JUDE CHILDRENS HOSPITAL!!!! TODAY’S OPPORTUNITY TO WIN PCH BIG CHECK SUPERPRIZE OF $10,000,000.00 FOR FAMILY AND THE ST JUDE CHILDRENS HOSPITAL! TODAY’S 2ND OPPORTUNITY TO WIN PCH BIG CHECK SUPERPRIZE OF $10,000,000.00 FOR FAMILY AND THE ST JUDE CHILDRENS HOSPITAL!!!! TONIGHT OPPORTUNITY TO WIN PCH BIG CHECK SUPERPRIZE OF $10,000,000.00 FOR FAMILY AND ST JUDE CHILDRENS HOSPITAL!!! TONIGHT 2ND OPPORTUNITY TO WIN $10,000,000.00 BIG CHECK SUPERPRIZE FOR FAMILY SND THE ST JUDE CHILDRENS HOSPITAL!!! TODAY’S PCH OPPORTUNITY TO WIN BIG CHECK SUPERPRIZE OF $10,000,000.00 FOR FAMILY AND THE ST JUDE CHILDRENS HOSPITAL!!!!! TODAY’S SPECTRUM OPPORTUNITY TO WIN PCH BIG CHECK SUPERPRIZE OF $10,000,000.00 FOR FAMILY AND THE ST JUDE CHILDRENS HOSPITAL!!!! WIN FOR FAMILY AND THE ST JUDE CHILDRENS HOSPITAL THE PCH SUPER PRIZE CHECK OF $10,000,000.00 ON APRIL 26TH!!! TODAY’S WIN OPPORTUNITY TO GO FOR BIG CHECK SUPERPRIZE FOR $10,000,000.00 FOR FAMILY AND ST JUDE CHILDRENS HOSPITAL!!! SEARCH 2ND TODAY’S OPPORTUNITY TO WIN BIG CHECK SUPERPRIZE CHECK OF $10,000,000.00 FOR FAMILY AND THE ST JUDE CHILDRENS HOSPITAL!!! 2ND SEARCH TO WIN SUPERPRIZE BIG CHECK OF $10,000,000.00 FOR FAMILY AND ST JUDE CHILDRENS HOSPITAL!!! SPECTRUM SEARCH TO WIN SUPERPRIZE BIG CHECK OF $10,000,000.00 FOR FAMILY AND THE ST JUDE CHILDRENS HOSPITAL!!! TONIGHT SWEEPSTAKES PIT OPPORTUNITY TO WIN PCH SUPERPRIZE OF $10,000,000.00 FOR FAMILY AND ST JUDE CHILDRENS HOSPITAL!!! SPECTRUM SWEEPSTAKES PIT TONIGHT OPPORTUNITY TO WIN $10,000,000.00 BIG CHECK SUPERPRIZE FOR FAMILY AND THE ST JUDE CHILDRENS HOSPITAL!!! TODAY’S SWEEPSTAKES OPPORTUNITY TO WIN PCH BIG CHECK SUPERPRIZE OF $10,000,000.00 FOR FAMILY AND ST JUDE CHILDRENS HOSPITAL!!! SPECTRUM SWEEPSTAKES PIT OPPORTUNITY TO WIN $10,000,000.00 SUPERPRIZE CHECK FOR FAMILY AND THE ST JUDE CHILDRENS HOSPITAL!!! TONIGHT’S SPECTRUM SWEEPSTAKE PIT OPPORTUNITY TO WIN $10,000,000.00 FOR FAMILY AND THE ST JUDE CHILDRENS HOSPITAL!!! SPECTRUM OPPORTUNITY TO WIN THE BIG CHECK SUPERPRIZE OF $10,000,000.00 FOR FAMILY AND THE ST JUDE CHILDRENS HOSPITAL!!!! FIRST OPPORTUNITY OF SWEEPSTAKES PIT TONIGTH TO WIN $10,000,000.00 FOR FAMILY AND THE ST JUDE CHILDRENS HOSPITAL!!!! TONIGTH OPPORTUNITY TO WIN $10,000,000.00 BIG CHECK SUPERPRIZE SWEEPSTAKES PIT FOR FAMILY AND ST JUDE CHILDRENS HOSPITAL! 2ND SEARCH OPPORTUNITY TO WIN BIG CHECK OPPORTUNITY ON PCH SWEEPSTAKES PIT OF $10,000,000.00 FOR FAMILY AND THE ST JUDE CHILDRENS HOSPITAL! TODAY’S OPPORTUNITY TO WIN THE SWEEPSTAKES PIT BIG CHECK SUPERPRIZE OF $10,000,000.00 FOR FAMILY AND THE ST JUDE CHILDRENS HOSPITAL!!! FRONT PAGE TODAY’S OPPORTUNITY TO WIN THE BIG CHECK PCH SUPERPRIZE OF $10,000,000.00 FOR FAMILY AND THE ST JUDE CHILDRENS HOSPITAL. TONIGHT SWEEPSTAKES PIT OPPORTUNITY TO WIN BIG CHECK SUPERPRIZE OF $10,000,000.00 FOR FAMILY AND THE ST JUDE CHILDRENS HOSPITAL!!! SPECTRUM TONIGHT OPPORTUNITY TO WIN PCH BIG CHECK OF $10,000,000.00 FOR FAMILY AND THE ST JUDE CHILDRENS HOSPITAL! TODAY’S SWEEPSTAKES PIT OPPORTUNITY TO WIN BIG CHECK OPPORTUNITY OF $10,000,000.00 FOR FAMILY AND THE ST JUDE CHILDREN’S HOSPITAL! SPECTRUM SWEEPSTAKES PIT OPPORTUNITY TO WIN THE BIG CHECK SUPERPRIZE OF $10,000,000.00 FOR FAMILY AND THE ST JUDE CHILDREN’S HOSPITAL. TONIGHT SPECTRUM OPPORTUNITY TO WIN PCH BIG CHECK SUPERPRIZE OF $10,000,000.00 FOR FAMILY AND THE ST JUDE CHILDREN’S HOSPITAL! SPECTRUM SWEEPSTAKES PIT TO WIN PCH BIG CHECK SUPERPRIZE OF $10,000,000.00 FOR FAMILY AND THE ST JUDE CHILDREN’S HOSPITAL! TODAY’S OPPORTUNITY TO WIN BIG CHECK SUPERPRIZE OF $10,000,000.00 FOR FAMILY AND ST JUDE CHILDREN’S HOSPITAL. SPECTRUM SWEEPSTAKES PIT TO WIN PCH BIG CHECK SUPERPRIZE OF $10,000,000.00 FOR FAMILY AND THE ST JUDE CHILDREN’S HOSPITAL. 1ST TONIGHT SPECTRUM SWEEPSTAKES PIT OPPORTUNITY TO WIN THE BIG CHECK SUPERPRIZE OF $10,000,000.00 FOR FAMILY AND THE ST JUDE CHILDREN’S HOSPITAL. DAY OPPORTUNITY FROM PCH SWEEPSTAKES PIT TO WIN THE BIG CHECK SUPERPRIZE OF $10,000,000.00 FOR FAMILY AN THE ST JUDE CHILDREN’S HOSPITAL. MORNING SECOND OPPORTUNITY FROM SPECTRUM TO WIN THE PCH BIG CHECK SUPERPRIZE OF $10,000,000.00 FOR FAMILY AND THE ST JUDE CHILDREN’S HOSPITAL. I PLAY TO WIN, AND WITH THE POWEE OF PRAYER! I WILL WIN! BECAUSE IM IN IT TOO WIN IT! TONIGHT OPPORTUNITY FROM SPECTRUM TO WIN PCH BIG CHECK SUPERPRIZE OF $10,000,000.00 FOR FAMILY AND THE ST JUDE CHILDREN’S HOSPITAL. TODAY’S SWEEPSTAKES PIT OPPORTUNITY TO WIN PCH BIG CHECK SUPERPRIZE OF $10,000 000.00 FOR FAMILY AND THE ST JUDE CHILDREN’S HOSPITAL. TODAY’S SPECTRUM SWEEPSTAKES PIT OPPORTUNITY TO WIN THE PCH BIG CHECK SUPERPRIZE OF $10,000,000.00 FOR FAMILY AND THE ST JUDE CHILDREN’S HOSPITAL. TONIGTH SWEEPSTAKES PIT TO WIN PCH BIG CHECK SUPERPRIZE FOR $10,000,000.00 FOR FAMILY AND THE ST JUDE CHILDREN’S HOSPITAL. WIN TONIGTH SPECTRUM OPPORTUNITY TO WIN PCH BIG CHECK SUPERPRIZE OF $10,000,000.00 FOR FAMILY AND THE ST JUDE CHILDREN’S HOSPITAL! WIN PCH SWEEPSTAKES PIT BIG CHECK SUPERPRIZE OF $10,000,000.00 FOR FAMILY AND THE ST JUDE CHILDREN’S HOSPITAL. WIN SWEEPSTAKES PIT PCH SPECTRUM BIG CHECK SUPERPRIZE OF $10,000,000.00 FOR FAMILY AND THE ST JUDE CHILDREN’S HOSPITAL. TONIGHT OPPORTUNITY TO WIN THE BIG CHECK SUPERPRIZE OF $10,000,000.00 FOR FAMILY AND THE ST JUDE CHILDREN’S HOSPITAL. TONIGTH SWEEPSTAKES PIT OPPORTUNITY TO WIN THE BIG CHECK SUPERPRIZE TO WIN $10,000,000.00 FOR FAMILY AN THE ST JUDE CHILDREN’S HOSPITAL. TODAY’S 1ST OPPORTUNITY TO WIN BIG CHECK SUPERPRIZE OF $10,000,000.00 FOR FAMILY AND THE ST JUDE CHILDREN’S HOSPITAL. PCH SPECTRUM PIT OPPORTUNITY TO WIN THE BIG CHECK SUPERPRIZE OF $10,000,000.00 FOR FAMILY AND THE ST JUDE CHILDREN’S HOSPITAL. WIN THE SWEEPSTAKES PIT OF $10,000,000.00. FOR FAMILY AND THE ST JUDE CHILDREN’S HOSPITAL. WIN THE PCH SPECTRUM SWEEPSTAKES PIT OF $10,000,000.00 FOR MY FAMILY AND THE ST JUDE CHILDREN’S HOSPITAL. TONIGTH OPPORTUNITY TO WIN THE BIG CHECK SUPERPRIZE OF $10,000,000.00 FOR FAMILY AND THE ST JUDE CHILDREN’S HOSPITAL! TONIGTH SPECTRUM OPPORTUNITY TO WIN THE BIG CHECK SUPERPRIZE OF $10,000,000.00 FOR FAMILY AND THE ST JUDE CHILDREN’S HOSPITAL! TODAY’S. PCH SWEEPSTAKES PIT OPPORTUNITY TO WIN THE BIG CHECK SUPERPRIZE OF $10,000,000.00 FOR FAMILY AND THE ST JUDE CHILDREN’S HOSPITAL. PCH SPECTRUM OPPORTUNITY TO WIN THE $10,000,000.00 SWEEPSTAKES PIT BIG CHECK SUPERPRIZE FOR FAMILY AND THE ST JUDE CHILDREN’S HOSPITAL. TONIGTH PCH SPECTRUM BIG CHECK SUPERPRIZE OF $10,000,000.00 FOR FAMILY AND THE ST JUDE CHILDREN’S HOSPITAL. PCH TODAY’S OPPORTUNITY TO WIN THE PCH BOG CHECK SUPERPRIZE OF $10,000,000.00 FOR FAMILY AND THE ST JUDE CHILDREN’S HOSPITAL. PCH SPECTRUM TODAY’S OPPORTUNITY TO WIN BIG CHECK SUPERPRIZE OF $10,000,000.00 FOR FAMILY AND THE ST JUDE CHILDREN’S HOSPITAL. PCH SPECTRUM TODAY’S OPPORTUNITY TO WIN THE $10,000,000.00 BIG CHECK SUPERPRIZE FOR FAMILY AND THE ST JUDE CHILDREN’S HOSPITAL. PCH TODAY’S OPPORTUNITY TO WIN FOR FAMILY AND THE ST JUDE CHILDREN’S HOSPITAL THE BIG CHECK SUPERPRIZE OF $10,000,000.00! TODAY’S OPPORTUNITY TO WIN PCH SWEEPSTAKES PIT OF $10,000,000.00 FOR FAMILY AND ST JUDE CHILDREN’S HOSPITAL. TODAYS OPPORTUNITY TO WIN THE PCH SWEEPSTAKES PIT BIG CHECK SUPERPRIZE OF $10,000,000.00 FOR FAMILY AND THE ST JUDE CHILDREN’S HOSPITAL! TODAY’S OPPORTUNITY FROM EVERYDAYIFE TO WIN THE $10,000,000.00 PCH BIG CHECK SUPERPRIZE FOR FAMILY AND THE ST. JUDE CHILDREN’S HOSPITAL. WIN TODAY’S FROM PCH SWEEPSTAKES PIT BIG CHECK SUPERPRIZE OF $10,000,000.00 FOR FAMILY AND THE ST JUDE CHILDREN’S HOSPITAL! WIN TODAY’S FROM PCH SWEEPSTAKES PIT BIG CHECK OF $10,000,000.00 FOR FAMILY AND THE ST JUDE CHILDREN’S HOSPITAL! TONIGHT OPPORTUNITY FROM PCH SPECTRUM OF $10,000,000.00 FOR FAMILY AND THE ST JUDE CHILDREN’S HOSPITAL.